Following the recent announcement of our London office expansion, we wanted to take a step back and share why we chose Marylebone as the perfect location to set up a second office and grow our operation in the capital. Back in early 2016, we found that our London-based clients and professional contacts had grown considerably over a number of years and this was set to continue in the future. We were also witnessing substantial growth in our property and international specialisms and that increased investment within these sectors was particularly prominent in London as well as Oxford. With this in mind, our challenge was to find an office that was perfectly positioned to support both our growing client base as well as capitalising on London’s property and international markets. We also wanted a space which complemented our Oxford office in Summertown – a modern building that would attract talented professionals and provide fresh meeting rooms for our clients and professional contacts. What first attracted us to Marylebone was the fantastic transport links that the area had to offer. The newly developed Chiltern Railway linking London Marylebone to Oxford Parkway and more recently Oxford, allowed a strong working relationship between our Oxford and London offices and a cohesion that would enable us to offer first class client work. From our office in Devonshire Street, there is also excellent transport routes to London Heathrow, with direct lines from both nearby Paddington and Bond Street. These connections allow us increased accessibility to our international clients. Both Bond Street and Paddington are also set to be two stations on the Elizabeth Line giving Marylebone increased links to our clients situated in London’s surrounding counties. As property specialists, we wanted to place ourselves in an improving and expanding property market – Marylebone was exactly that. With more of Mayfair’s residents moving out to the area, the regeneration of Marylebone High Street and the redevelopment of neighbouring Tottenham Court Road, Marylebone has seen increased property investment. A recent report from Knight Frank shows that over 300 new units have been developed in the Marylebone area alone since 2011. The increasing demand in medical businesses wanting to set up in Harley Street has also created significant boost in the area’s commercial property sector. 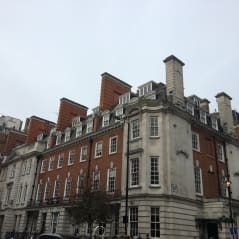 This has been exemplified by the Howard De Walden Estate – a property empire in Marylebone – who had an increase of 11 new medical tenants in the last year alone. Despite concern over London property prices, it is clear that the need for property and growth in the development market will continue, especially in thriving areas such as Marylebone. As touched upon earlier, a prerequisite for our office search was finding a space where our existing employees would want to work but also a space that could attract the finest talent in a competitive market. It was important that this new space could replicate the feel and culture that we had worked hard to develop in Summertown. In Marylebone, we found a place that would offer our employees a calm, village feel just minutes away from Central London. This combined with the variety of cafes, cultural attractions and pedestrian feel allows our team to feel at home, whilst at work. If you like the sound of becoming one of our growing London team, visit our careers page. So here are a few reasons as to why we chose Marylebone to be the home of our London office. A great location for our clients and staff, where we can continue to grow our business for years to come. Our larger office space in 3-4 Devonshire Street is now open, so please do come and visit. To set up an appointment contact us via email or call 020 7436 4773.